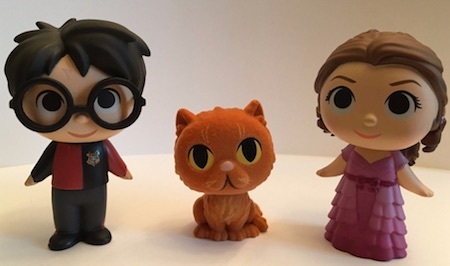 While it took some time, Potterheads finally have a Mystery Minis set to call their own! Funko Harry Potter Mystery Minis is the debut release for the popular franchise. The initial set includes 23 miniature figures that are issued in a blind-box format. Likely the first series of many to come, Funko Harry Potter Mystery Minis includes the biggest names from the world of Hogwarts, with staples like Dumbledore, Hermione, Ron, and Harry. Offering several firsts for the fans of the movies, Professor McGonagall is joined by multiple animals that played a prominent role in the story, including Hedwig, Nagini, and Fawkes. Shop for Funko Harry Potter Mystery Minis figures on Amazon. Each main figure is paired with a smaller option that has a connection to the subject. While nearly all the duos are main subjects alongside their faithful pets, putting Dobby the elf with Draco Malfoy is a bit odd. Because they are issued in a blind-box format, the actual figures in each box are unknown until opened. This keeps the suspense and makes building the set more of a challenge. Adding to the difficulty, there are three different formats, each with exclusive figures. The main set is joined by exclusives at Barnes & Noble and Hot Topic. Although these are the first Harry Potter figures to fall under the Mystery Minis label, there are already plenty of Funko Pop Harry Potter figures available for the films. Slightly larger than the minis, the Pop! line is more detailed and offers multiple options for the key names. There are also Funko Pocket Pop Harry Potter keychains. 23 figures. Individual odds and exclusives noted below. Funko Mystery Mini Harry Potter Complete Set All 3 Series W 2 Exclusives Bonus! Funko Mystery Minis Harry Potter Series 3 Moaning Myrtle & Tom Riddle B&N! HARRY POTTER FUNKO MYSTERY MINIS SERIES 1 HARRY FIGURE MINI ORIGINAL - RARE! is this list going to be updated to show rarity and exclusives?